Is Nexus One Leading The Mobile Revolution? I believe we are in the midst of a mobile revolution. Mobile phones (iPhone, Nexus One, Blackberry, etc…) and now mobile devices (i.e. iPad, HP Slate, etc…) are starting to dominate the mobile landscape. When I drive around town, which is a very big college town mind you, I see people walking around the streets with either a mobile phone up to their ear or their face staring down at a mobile device. What are they doing while staring down? They are either reading something on the web, reading a text message, or creating a text reply or email. It’s sometimes funny actually to see so many people walking around town engaging in their mobile device. In a lot of cases it’s scary because the same is true with people in their cars. I’m seeing more and more people driving down interacting with their mobile phones. And I don’t mean just talking on the phone. People are texting, reading web pages, emails, etc… everything you’d normally do while sitting at a desk in front of a computer. So when it comes to these mobile phones, what particular device stands out from the rest? In my opinion, Google’s Nexus One is head and shoulders above all other devices. Simply from the point of diversity, Google’s Nexus One is powered by an open source platform – that being Android (and now Android 2.1). That means that any application can be installed and run on the device and it is not confined to a particular protocol like the iPhone OS. Because of the open source Android platform, multiple carrier exposure, and prominent features that come standard on the Nexus One phone, I believe we will see Google’s Nexus One far ahead of all other devices as the mobile revolution continues to unfold. Do you agree that we are in the midst of a mobile revolution? 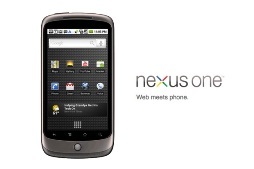 Do you agree that Google’s Nexus One is leading the mobile industry? thanks for commenting – I can't wait to see what Microsoft's answer is to the smart phone war!